1.Spray 13 x 9-inch baking dish with nonstick cooking spray; line with parchment paper. In large bowl, place cereal. 2.In small saucepot, stir syrup, almond butter and coconut oil; cook over medium-high heat 5 minutes or until melted. Remove from heat; stir in food coloring. Pour syrup mixture over cereal; with wooden spoon, stir until well combined. Press mixture into prepared pan; let cool. 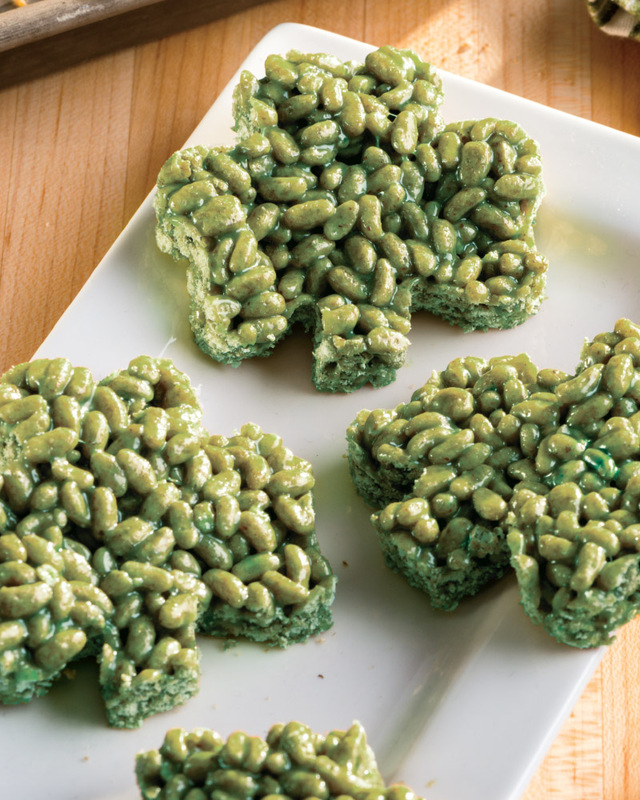 3.Lift parchment paper with rice crispie from pan and place on cutting board; with 3-inch shamrock-shaped cutter, cut out crispies. Makes 12 crispies. To make natural green food coloring: Place 1 cup fresh spinach in small saucepot; add water to cover. Heat to boil over high heat; reduce heat to low, cover and simmer 5 minutes. Drain spinach and process with 3 tablespoons water in food processor until smooth (add 1 tablespoon water at a time if mixture clumps together); strain through fine-mesh strainer. Discard solids; refrigerate food coloring in airtight container up to 3 days.